First Look: Eddie Murphy on the Set of Beverly Hills Cop. The Heat is On! Production on director Barry Sonnenfeld’s Beverly Hills Cop CBS TV pilot is well underway in LA. 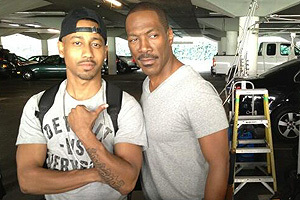 The first set photo shows Brandon T. Jackson and Eddie Murphy in his recurring role as Axel Foley. Jackson (Tropic Thunder) stars as Axel’s son Aaron, a freewheeling police officer who works to take down the criminal elements of the rich and famous in Beverly Hills. The show is a follow-up to the successful Beverly Hills Cop Trilogy that chronicled the exploits of wise-cracking Detroit detective Axel Foley in Los Angeles. In BEVERLY HILLS COP, Brandon T. Jackson (Tropic Thunder, Percy Jackson & the Olympians: The Lightning Thief) stars as Axel Foley’s son Aaron, a freewheeling police officer who works to take down the criminal elements of the rich and famous in Beverly Hills. The show is a follow-up to the successful Beverly Hills Cop Trilogy that chronicled the exploits of wise-cracking Detroit detective Axel Foley in Los Angeles. Eddie Murphy will reprise his role as Axel in the pilot. Sony Pictures Television is producing the project.